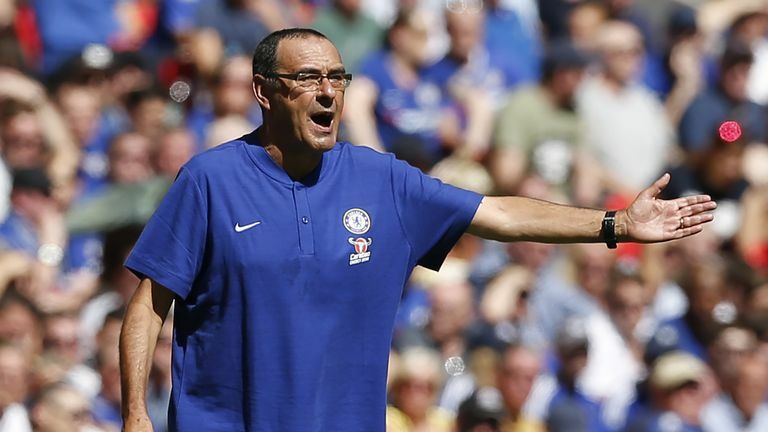 Maurizio Sarri rued the profligacy of Chelsea striker Alvaro Morata after Thursday night's 1-0 win at PAOK Salonika. Willian's seventh-minute strike was the difference for the Blues, who have five wins from five Premier League games, but Pedro and Morata spurned numerous opportunities to add to the lead. "We were in control of the match for 90 minutes," said head coach Sarri. "We have had a lot of opportunities. We missed several. "So I am really very happy with the three points, very happy with the performance, but I am not very happy with the result. "When it is time to kill the match we have to kill the match." Morata began his Chelsea career with seven goals in eight games last season, but has appeared short of confidence throughout much of 2018. He has scored once this season, in the 3-2 win over Arsenal last month. Sarri is scratching his head at how to revive Morata's morale but praised his improved movement. "Alvaro has to gain confidence with one, two, three goals," Sarri added. "I am not able to give him confidence. In this match, he has had three, four opportunities. He was unlucky. "I hope for him that in the future I can try to help him, but the confidence can come only with goals.